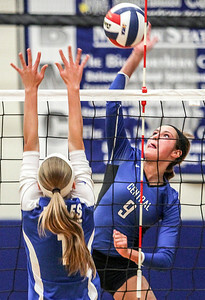 Sarah Nader- snader@shawmedia.com Burlington Central's Jenna Schudel hits the ball over during Tuesday's Class 3A Burlington Central Sectional semifinal against Lakes in Burlington November 5, 2013. 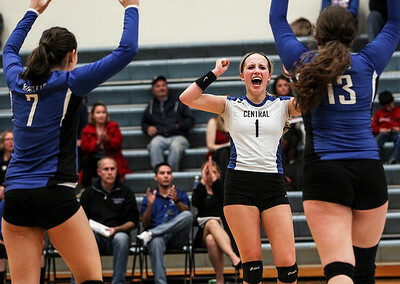 Sarah Nader- snader@shawmedia.com Burlington Central's Allie O'Reilly celebrates a point during Tuesday's Class 3A Burlington Central Sectional semifinal against Lakes in Burlington November 5, 2013. 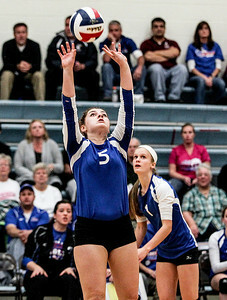 Sarah Nader- snader@shawmedia.com Burlington Central's Jenna Schudel returns the ball during Tuesday's Class 3A Burlington Central Sectional semifinal against Lakes in Burlington November 5, 2013. 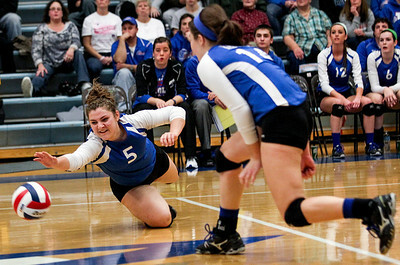 Sarah Nader- snader@shawmedia.com Lakes' Maddie Demo dives for the ball during Tuesday's Class 3A Burlington Central Sectional semifinal against Burlington Central in Burlington November 5, 2013. 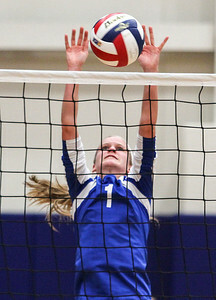 Sarah Nader- snader@shawmedia.com Lakes' Abbey Buehler jumps to block the ball during Tuesday's Class 3A Burlington Central Sectional semifinal against Burlington Central in Burlington November 5, 2013. 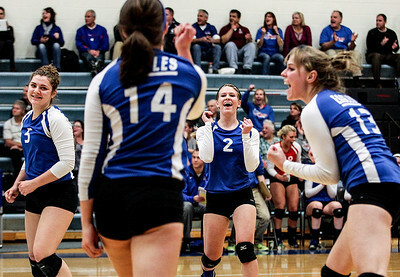 Sarah Nader- snader@shawmedia.com Lakes' Lisa Buehler (center) celebrates a point during Tuesday's Class 3A Burlington Central Sectional semifinal against Burlington Central in Burlington November 5, 2013. 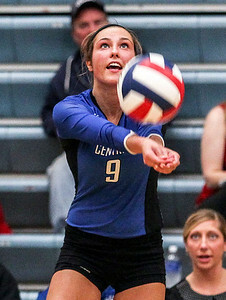 Sarah Nader- snader@shawmedia.com Lakes' Maddie Demo sets the ball during Tuesday's Class 3A Burlington Central Sectional semifinal against Burlington Central in Burlington November 5, 2013. 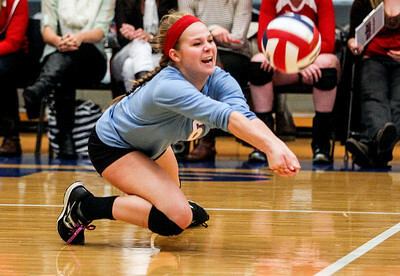 Sarah Nader- snader@shawmedia.com Marian Central's Frankie Taylor dives for the ball during Tuesday's Class 3A Burlington Central Sectional semifinal against Regina Dominican in Burlington November 5, 2013. Marian Central won, 2-0. 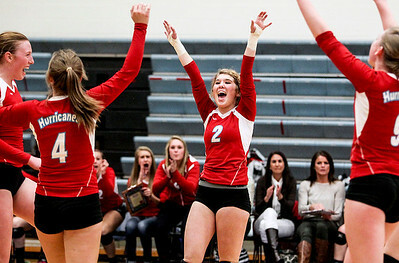 Sarah Nader- snader@shawmedia.com Marian Central's Sarah Hendle (center) celebrates with her teammates after winning Tuesday's Class 3A Burlington Central Sectional semifinal against Regina Dominican in Burlington November 5, 2013. Marian Central won, 2-0. 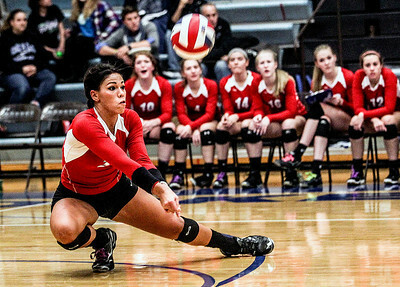 Sarah Nader- snader@shawmedia.com Marian Central's Bethany Bucci dives for the ball during Tuesday's Class 3A Burlington Central Sectional semifinal against Regina Dominican in Burlington November 5, 2013. Marian Central won, 2-0. 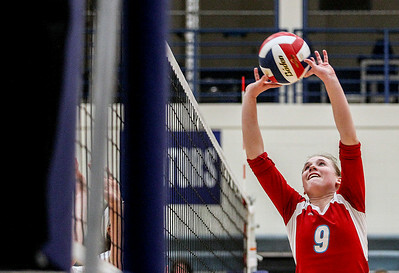 Sarah Nader- snader@shawmedia.com Marian Central's Alex Kaufmann sets the ball during Tuesday's Class 3A Burlington Central Sectional semifinal against Regina Dominican in Burlington November 5, 2013. Marian Central won, 2-0. 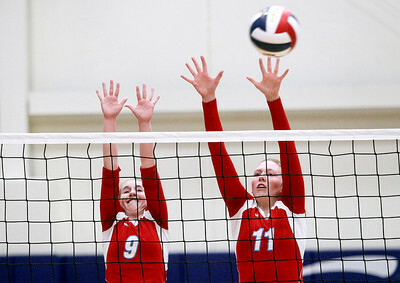 Sarah Nader- snader@shawmedia.com Marian Central's Alex Kaufmann (left) and Hannah Davis jump to block the ball during Tuesday's Class 3A Burlington Central Sectional semifinal against Regina Dominican in Burlington November 5, 2013. Marian Central won, 2-0. 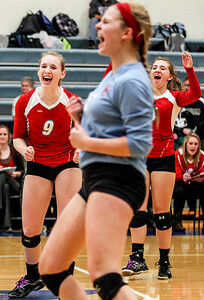 Sarah Nader- snader@shawmedia.com Marian Central's Alex Kaufmann (left) celebrates after winning Tuesday's Class 3A Burlington Central Sectional semifinal against Regina Dominican in Burlington November 5, 2013. Marian Central won, 2-0. Sarah Nader- snader@shawmedia.com Marian Central's Rachel Giustino hits the ball during Tuesday's Class 3A Burlington Central Sectional semifinal against Regina Dominican in Burlington November 5, 2013. Marian Central won, 2-0. 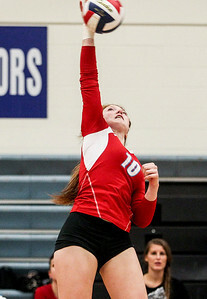 Marian Central's Alex Kaufmann sets the ball during Tuesday's Class 3A Burlington Central Sectional semifinal against Regina Dominican in Burlington November 5, 2013. Marian Central won, 2-0.